I appear to be incapable of making correct CPs on my first try. I found a few errors on my original CP for the Fairy Archer. I finally got around to making a Crease Pattern for my Fairy Archer! Enjoy! Sorry for lack of posting in the last 6 months. Kinda got distracted what with Pokemon X and Y coming out and whatnot. Anywho, you may see some Pokemon designs on here soon. I've been folding a little less. Folded a SK Cerberus a few weeks back. No new designs worth mentioning. 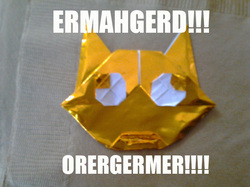 this is an entry for the origami forum challenge: internet memes. 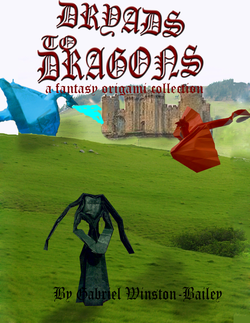 i think i may have found the final cover for my book. i've been working on a prototype for my book. this is the cover. this is something interesting. i tried doing some designing with unusual materials. the result was my new design; my paper bag bird! 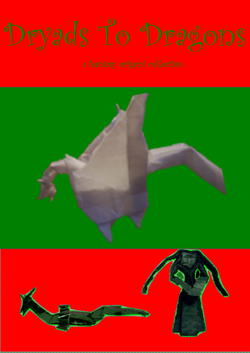 i am starting my Passion Origami collection with the second and third books. they are great! i may have a model (my hobbes bookmark) in a book! 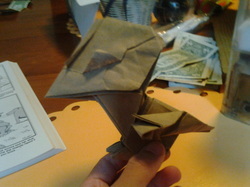 i made a victini head for the english origami forum pokemon challenge. i took a few new pictures of arcticuno. a few people said they were hard to see in the other one. i'm posting it on the forum and will add a link to it. i made some diagrams for the blintz bird base! can someone test them out? i designed a new arcticuno for the origami forum pokemon challenge! a few new models. one of them is the flapping dragon designed by me and the other one is the rose container designed by me. i made a small mistake on the previous crease pattern. here is the correct one. i made the CP for volcarona! it took a really long time but i think it came out well. folding from the crease pattern won't get you quite to the finished model as usual but it will get you pretty close. it has been a long time since i posted but i designed a ew new models including a dryad. i wil get pics as soon as possible. i am sorry it has been a really long time since i posted i designed lots of new models and i am starting to get the hang of diagramming with inkscape so you might have some new diagrams soon. it has been a while since i posted so sorry for that. im going to say i added the instructions for kozasa keiichi pikachu. it is in tanteidan convention book 5 which is out of print so these diagrams are actually kind of rare. i designed a few new models and will try to get pictures of them. sorry for the rearranging in the gallery. i was testing out a new system. i like it more . new model! ways to diagram it but the best ones either cost money or are for a different computer. a little advice please? good news! i am now displaying origami folded by me but designed by other people! 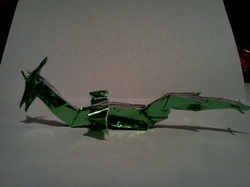 starting soon i will show the other origami i have made. 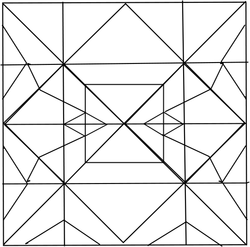 Hello my name is Gabriel Winston Bailey I am 9 years old and I like doing origami. In this website you will see pictures and diagrams of my origami. The only ones i put on this website are the ones that i have invented. later i may display origami i did designed by other people.